Emphasis Records-USA in synchrony with TB Productions Ireland, are throwing a John Breen Album Listening Party and show on December 12th, to celebrate the forthcoming release of Breen’s new album titled ‘Origins’. Sally O’Brien’s Arklow, John’s hometown, will host the event. The show includes a lineup of internationally acclaimed guest artists, making the musical event one of County Wicklow’s biggest of the year. Scheduled guest appearances on the bill are, Ború Ireland, renowned singer/songwriter Martyn Travis, International recording artist and hit songwriter Francie Conway who is currently recording with Finbar Furey and Christy Dignam of Aslan, singer/songwriter Pat Crowe who has written many of the scripts and songs for Bosco, Des Tobin from The Arbour Men, Irish country music star Brian Lawlor, Dublin’s Dicey Reilly and Noelie Colohan, Joe O’ Connor winner of the Rí Sessions and Bernard Fox, among others who will take to the stage during Breen’s set. “There’s no better way for me to celebrate the release of my new album ‘Origins’ than with my fans, family and friends, up-close-and-personal. I am so excited for everyone to hear these new songs at the listening party, to be able to give away some cool prizes, and to meet as many of you as possible. Let’s make some noise in Arklow, it’s going to be one heck of a hoolie,” says Breen. On his new album ‘Origins’, Breen explores a journey of the origins of Celtic music and its evolution. Terming the musical content “Greengrass” music, the album traverses the Celtic exodus to America and the pockets of Irish settlers in the Appalachian Mountains, down a melodic path combining Celtic music with Bluegrass music, Old-Time Country music, Southern Gospel music, Contemporary Country, and Folk. Singing his way from the Wicklow Mountains to the Appalachian Mountains, and bringing it all back home again. ‘Origins’ is produced, mixed, and engineered or co-engineered by the award-winning producer Stevie Hawkins. His country music credits include national and international recording artists, Daryle Singletary, Jeff Carson, Doug Stone, Razzy Bailey, Jim Ed Brown, Glen Campbell, Tanya Tucker, Webb Pierce, Charlie McCoy, Johnny Rodriguez, Cledus T. Judd, among others. The new album includes also the talents of Tim Crouch, who’s credits include, Dolly Parton, George Jones, Vince Gill, Josh Turner, Charlie Daniels, Hal Ketchum, performing fiddle on country music star Alan Jackson’s 2013 “The Bluegrass Album“, and bluegrass music star Rhonda Vincent’s #1 Billboard 2014 album “Only Me”, among many others. Known as one the finest fiddler players in the United States, Tim’s skills as a multi-instrumentalist are legendary. Tim is also co-engineer of John Breen’s album, Origins. Fans in the audience will have the chance to win a variety of prizes to include, John Breen download cards, T-Shirts, autographed CDs, custom John Breen-Origins guitar picks, complimentary of Emphasis Records. Single release expected for iTunes pre-sale Dec. 12th, 2014. 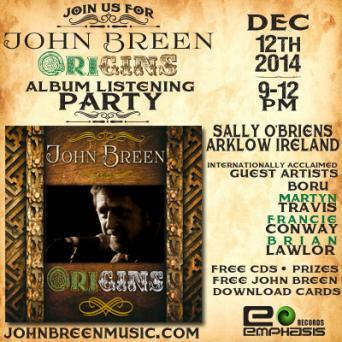 Come join the John Breen ‘Origins’ album listening party, for 3 hours of great music. December 12th, 9:00 pm at Sally O’Brien’s, Arklow Ireland. Doors open at 8:00 pm, the event begins at 9:00 pm sharp. Free admission with invitation, valid only until 9.30 pm. John Breen a native of Arklow, County Wicklow, has a pure powerful singing style traditional of the likes of the legendary Ronnie Drew infused with a bit of Ernest Tubb and Johnny Cash thrown in for good measure. A passionate singer of well known Irish as well as his original songs, combined with an intriguing blend of contemporary Celtic music, John Breen comes from a pedigree musical background; grandfather Tommy Costello was one of the founders of the Arklow Pipe Band, brother Tommy Breen a founding member of legendary trad/folk group Boru, and his sister Charlotte, who collaborates with John on many of his songs, is a published lyricist in the USA and an Los Angeles Music Awards executive producer award winner.